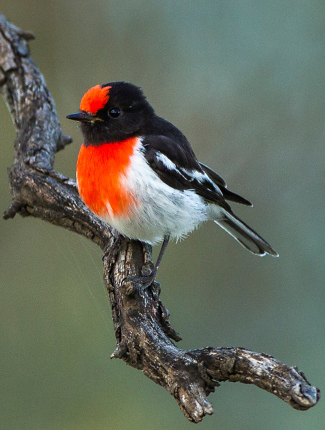 A cracking Red-capped Robin in Wyperfield National Park by Francesco Veronesi. These days it is possible to travel along the once very remote and dangerous Birdsville and Strzelecki Tracks in conventional vehicles and sleep in a bed at night. However, temperatures still rise dangerously high along these tracks so it is wise to take all precautions against hyperthermia and the possibility of breaking down and no one else coming along with water and food in time. South of Adelaide there is a viewable Little Penguin colony on Granite Island just off the Fleurieu Peninsula, and, across the water, on Kangaroo Island there are large colonies of New Zealand Fur Seals (notably at Admirals Arch and Cape du Couedic) and Australian Sealions (notably at Seal Bay Conservation Park), other mammals such as Western Grey Kangaroo, Tammar Wallaby, Western Pygmy Possum and Dunnart (as well as Koala and Platypus, both of which have been introduced), and Leafy Sea Dragons offshore. Cage diving for Great White Sharks takes place in the Neptune Islands, 44 miles out of Port Lincoln, on trips run by Rodney Fox Expeditions. Male sharks are resident but the larger females are usually only around from May to July. Travelling west from Port Augusta to the Nullarbor Western (Thick-billed) Grasswren occurs in the Wild Dog Hills above Whyalla; Rufous Treecreeper and Copperback (Chestnut) Quail Thrush in Lake Gilles CP; Short-tailed Grasswren at Mount Ive Station; the recently split White-bellied Whipbird, as well as Rock Parrot and Purple-gaped Honeyeater in Port Lincoln NP; Nullarbor Quail Thrush around Nullarbor Roadhouse; and Naretha Bluebonnet in Nullarbor NP. Australia is an island-continent not a small country and to look for all of its best wildlife in one go would involve a trip lasting several months. Therefore it is probably best to plan several visits: to Southeastern Australia where it is possible to see Koala, Platypus, Tasmanian Devil and birds such as Superb Lyrebird, Little Penguin, Plains-wanderer and Satin Bowerbird; Eastern Australia where the wildlife includes Koala, Platypus and birds such as Southern Cassowary, Albert's Lyrebird, Paradise and Victoria's Birds-of-paradise, and Regent Bowerbird; Northern Australia where Hooded Parrot, Rainbow Pitta and White-throated Grasswren occur, along with the famous waterbirds and Saltwater Crocodiles of Kakadu; Northwestern Australia where the endemic Black Grasswren occurs on the Mitchell Plateau in the Kimberley; and Western Australia where the wildlife includes Manta Ray, Whale Shark, Dugong, Numbat and birds such as Red-capped Parrot. Mulga Parrot by Mark Harper. 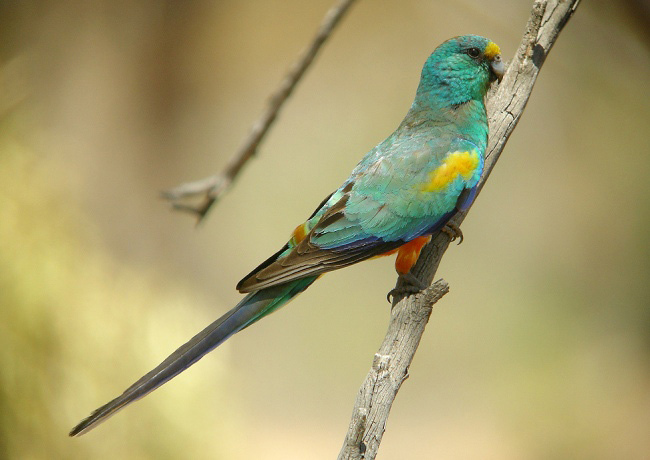 This spectacular parrot occurs in mulga and mallee country. Letter-winged Kite, Inland Dotterel, Eyrean, Grey, Short-tailed and Thick-billed Grasswrens, Gibberbird, Chestnut-breasted Whiteface and Cinnamon Quail Thrush. Malleefowl, Mallee Emuwren, Striated Grasswren, Black-eared Miner, Shy Heathwren, Chestnut Quail Thrush, Southern Scrub Robin and Rufous-lored Whistler. A chance of Black-breasted Kite, Grey Falcon, Flock Bronzewing, Budgerigar, Black, Painted and Pied Honeyeaters, Crimson and Orange Chats, and Ground Cuckoo Shrike. Emu, Black Swan, Australian Shelduck, Australian Pelican, White-faced and White-necked (Pacific) Herons, Australian and Straw-necked Ibises, Royal and Yellow-billed Spoonbills, Brown Goshawk, Spotted Harrier, Little and Wedge-tailed Eagles, Black and Brown Falcons, Australian Hobby, Australian (Purple) Swamphen, Australian Spotted and Spotless Crakes, Australian Bustard, Banded Stilt, Red-necked Avocet, Red-capped Plover, Black-fronted and Red-kneed Dotterels, wintering shorebirds such as Sharp-tailed Sandpiper (mostly Nov-Mar), Australian Pratincole, Fairy Tern, Common Bronzewing, Diamond Dove, Galah, Pink, Sulphur-crested and Yellow-tailed Black Cockatoos, Little Corella, parrots such as Elegant, Mulga and Regent, Purple-crowned and Rainbow Lorikeets, Adelaide (Crimson) and Yellow (Crimson) Rosellas, Horsfield’s Bronze Cuckoo, Tawny Frogmouth, Laughing Kookaburra, Red-backed Kingfisher, Rainbow Bee-eater, Splendid, Superb, Variegated and White-winged Fairywrens, honeyeaters including Grey-fronted, Purple-gaped and Tawny-crowned, Red-browed Pardalote, Weebill, thornbills, Rufous Fieldwren, Redthroat, Banded and Southern Whitefaces, Chestnut-crowned and White-browed Babblers, Chirruping Wedgebill, woodswallows including White-browed, Grey and Pied Butcherbirds, Grey Currawong, Varied Sittella, Gilbert’s, Golden and Rufous Whistlers, Grey Shrike Thrush, Magpie-lark, White-winged Chough, Apostlebird, Red-capped and Scarlet Robins, White-backed Swallow, Brown and Rufous Songlarks, and Diamond Firetail. Red and Western Grey Kangaroos, Yellow-footed Rock Wallaby, Common Wallaroo (Euro) and Southern Hairy-nosed Wombat. St Kilda Saltfields, Adelaide Banded Stilt, Red-necked Avocet and many other shorebirds, as well as other waterbirds including ducks and Fairy Tern. Altona Area, Barossa Valley, South Australia Diamond Firetail. Brookfield Conservation Park, South Australia A colony of Southern Hairy-nosed Wombats. Gluepot Reserve, South Australia Emu, White-browed Woodswallow, Splendid Fairywren, Striated Grasswren, Chestnut Quail Thrush, Southern Scrub Robin and White-fronted Honeyeater. Also a chance of Red-lored Whistler and Black-eared Miner (very rare and rapidly declining due to hybridization with the more widespread Yellow-throated Miner. Finding a “pure one” is much more likely with local help, perhaps in places not open to the general public). Berri area and Murray Sunset NP, Victoria A chance of Black-eared Miner, as well as Mallee Emuwren, Striated Grasswren and Red-lored Whistler. Hattah-Kulkyne NP Major Mitchell’s Cockatoo, Mulga and Regent Parrots, Splendid Fairywren, Mallee Emuwren, Striated Grasswren and Chestnut Quail Thrush. Wyperfield NP Little Corella, Regent Parrot, Mallee Ringneck, Red-capped Robin and Splendid Fairywren. Also a chance of Pink Cockatoo and Chestnut Quail Thrush. Hopetoun-Walpeup Road between Ouyen and Patchewollock Malleefowl (on road last hour before dusk). Little Desert NP Malleefowl (and in nearby Stringybark Nature Park), Yellow-tailed Black Cockatoo, Shy Heathwren and Tawny-crowned Honeyeater. Port Augusta Area Banded Stilt and Red-necked Avocet. Flinders Ranges Yellow-footed Rock Wallaby (Brachina Gorge in NP and Warren Gorge just north of Quorn), Common Wallaroo, Elegant Parrot and Grey-fronted Honeyeater (Brachina Gorge). Also a chance of Short-tailed Grasswren. Strzelecki Track Red Kangaroo, Cinnamon Quail Thrush, Chestnut-breasted Whiteface, Gibberbird, Thick-billed Grasswren and Chirruping Wedgebill. Also a chance of Letter-winged Kite (Strzelecki Crossing). Birdsville Track Red Kangaroo, Australian Bustard, Cinnamon Quail Thrush, Inland Dotterel, Gibberbird, and Eyrean (Mungerannie Bore) and Grey Grasswrens. Also a chance of Black and Grey (Mungerannie Roadhouse area) Falcons, Black-breasted Kite, Flock Bronzewing, Crimson, Orange and Yellow (Pandibura Bore) Chats, and Ground Cuckoo Shrike. Memorial 12 km south of Coober Pedy Thick-billed Grasswren and Chestnut-breasted Whiteface. Coober Pedy Sewage Works Pied Honeyeater and Orange Chat. The best time to be in the Outback is September-November, when the southern spring usually begins. Many trip reports, some for Outback Australia, are posted on the websites listed here. On some of these websites some reports are independent and some are posted by tour companies who organize tours to Outback Australia. These tour companies and others also post their own reports on their websites, which are listed under 'Some Organized Tours to Outback Australia' below. Tour companies who are running organized tours to Outback Australia in the next couple of years include the following. Many of these also offer custom tours.